Gelatofix Lifestyle cafe initially enticed customers with its over-the-top gelato creations. But did you know that this world-class cafe offers more than just gelato? Aside from Italian cuisine, it has now wandered into new territories with entrees designed to satisfy the craving of even the hungriest diner. 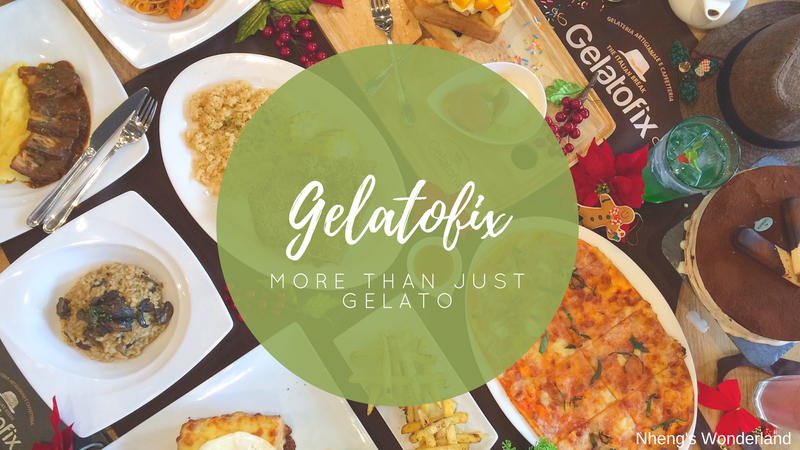 Just last week Zomato invited us to another food adventure to see what Gelatofix has to offer. Seeing thru the glass from the outside, my fellow foodies were already making their way by taking pictures of the food that were served. Space is well lit and the gelatos will meet you with wide arms. There are 3 screens at the counter and staff are all ready to serve you. Well hello there! I would love to talk more about their gelatos but I enjoyed their menu as well. I can't say any bad thing about every single thing served to us. But let's have it all here, shall we? This one is a chef's special! Hearty beef stew enriched with herbs in a rich tomato gravy. Some said that its a bit salty, but to my tasting, I found it just right especially if you incorporate it into the gravy. Prawns, creamy apricot tomato sauce, spaghetti. If you are a pasta lover, never miss this one. Both sweet and light in the palate. Mozzarella, white cheese, emmenthal, and cheddar cheese. I love how thin and crisps this is but oozing with the cheesiness flavor. A perfect breakfast for grilled cheese sandwich lovers, such as myself. It was satisfying even though it was already cold, what more if it serves hot. A simple but heavy meal. I would love to come back for this. A mouthful of delicious, golden fried, boneless chicken with special herbs and spices, with gravy and honey on the side. If I go back, I'll order this again. One of my favorites as it was crispy on the outside and so tasteful inside. Good for 3-4 persons. Thick toast cubes, diced mango, custard cream, honey, mixed fruits, chocolate sauce. It was a unique dessert to devour as it has a surprise that awaits you. One of the staff was generous to teach us how to devour on to the revelation. Moving the top box of the cube, inside is the chocolatey sauce where you have to dip into the small toast cubes or mango cubes on it. It definitely meets the expectation. The dish is created by Gelatofix Master Chef David Chang using Chef Ernst Friedrich Knam's world-renowned cioccolato. Sinfully delicious as it carries the taste of Italian coffee. Above all the desserts, don't forget to choose your gelato. You can even be adventurous and try the Gelato Sushi - a concoction of Gelato World Cup Champion Master Chef Filippo Novelli, which intricately combines the creaminess of gelato and the spice of this Japanese staple. Mr. Jay Tan, Managing Director of Gelatofix Philippines says: "Here at Gelatofix, we constantly create dishes that we know will leave a lasting imprint with diners. And, beyond the food, we have also positioned Gelatofix as a Lifestyle cafe for both young people and working adults whose cravings need to be complemented with good company and the right ambiance". Gelatofix is definitely more than just gelato! The good thing about all this? Gelatofix is just one street away from my office! 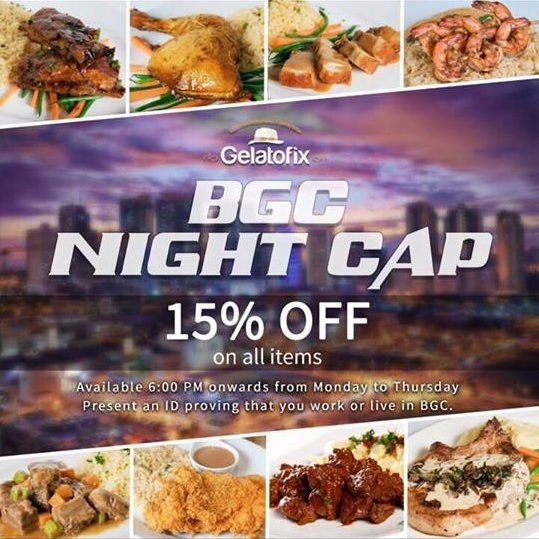 And it's very timely that they are offering 15% OFF on all items to those who work and live in BGC. Available 6PM onwards from Monday to Thursday. Can't wait to go back!